Are you currently planning your new horse riding arena? Or maybe you are looking to cover an existing dressage arena? I'm sure you will agree with me when I say, organising a new horse arena can be overwhelming. What's the best way to drain the arena? What materials should I use for my arena base? How can I pick the right riding surface without breaking the budget? 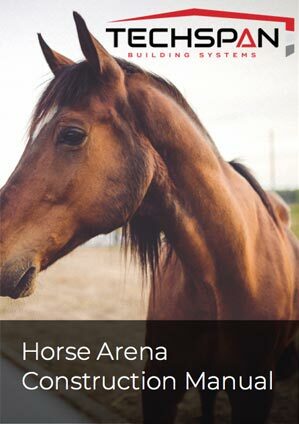 In this guide, we walk you through what you need to consider, and tips to making the horse arena construction process as easy as possible. Please Note: TechSpan Building Systems only manufacture the Structural Steel Roof covers for your arena. The earthwork and base preparation is best planned and completed with a a local earth-moving contractor in your area. We have prepared this article to help you plan. Firstly, you need to consider what you would like. Did you want to have a simple outdoor horse arena, or would you like a covered dressage arena for all-weather use? An outdoor riding arena is cheaper; however, an indoor riding arena will ensure a longer lasting arena with less damage caused by heavy rain. What will your horse arena be used for? What size did you want? The standard indoor dressage arena size is 60-metres by 20-metres. This is the same size used for Olympic and Grand Prix equestrian events. For a private training facility, a 40-metre by 20-metre building is popular. By answering these questions, it makes future decision a lot easier. The type of soil. Is it rocky? Sandy? Black dirt or red dirt? Will the arena fit in your desired location? Are there any other local building restrictions you will need to observe? One of the most significant factors you need to consider is the horse arena drainage. The last thing you want on your arena is pooling of water. Pools of water can create soft spots. These can impact the ride quality and will see a failure of the arena surface and sub-layers over time. Not good. To combat this, you need to make sure the location has adequate drainage. Different soil types are easier to drain than others. By putting your arena on a higher point on your property, you will ensure that water is less likely to pool on your riding ring. Having a roof cover over your horse arena will significantly reduce the impact of heavy rain on your arena surface. However, even with this added protection, if your arena is in a location where water gathers, you will be in for a hard time. A smart location choice will save you thousands in drainage costs and other future issues. Before we jump in, there are a couple of things we need to organise. I recommend you plan your project for the drier months. There will be many trucks coming in and out of your property. The last thing you want is a truck bogged in a muddy paddock. Consider how you will approach and access the arena. In both the short and long term, the ground leading up to your arena's location will need to allow easy access for trucks and other machinery. Before you start the dressage arena construction, you will need to clear the area and remove any trees and plants. Excess dirt will need to be stockpiles or disposed of. Many times your chosen area might not be entirely flat. You will need to consider whether you want to fill the area to get it level or cut and retain the slope. If your arena is on a sloping block, you will need to make sure that the foundation is correctly retained. The surface will then need to be compacted before you move on to constructing your arena. It will erode if not done correctly. Should I Build A Horse Riding Arena Cover Before Or After The Arena Base? Did you want a cover to protect you, your horses and arena from the elements? Maybe you wanted to be able to ride at night, or during wet weather? Whatever your reasons, constructing an indoor riding hall is a sound long-term investment. But, when should you start constructing it? It is better to build your roof first, then build the arena base inside the roof cover. If you were to build the base first, then construct its cover over the top, you would need to make the roof an extra 2 to 3 metres wide. This is to make room for the foundation on each side. This extra width means there will be a higher cost. After the roof is complete you can easily build the fencing against the shed columns. This is a more efficient use of space. A 20-metre arena can be built inside of a 21-metre roof. Erecting the roof first also saves money, because the builders can easily access the underside of the roof during construction. If the arena were in place beforehand, the installers will struggle to drive access equipment and cranes onto the base without damaging it. To overcome this, they may have to use larger cranes and machinery and equipment to build it from the side. The extra effort takes more time and money. By doing the roof first, our installers can erect the steel structure quicker, potentially saving you thousands of dollars. When installing a cover over an existing horse arena, there is always the slim chance something in the area could be damaged. If there were an accident in the installation process, it could result in damaged fencing or arena surface. By installing the roof first, there is no chance of screws, nuts, bolts, sharp metal filings or off-cuts accidentally falling and getting lost in the sand. These things can be a hazard to both horse and owner. Erect the roof first, you can be sure your arena will be in perfect condition for riding. For more information on how to construct your dressage arena, check out downloadable guide below. Stormwater control can potentially be one of the biggest issues you will face with maintaining your horse arena. It is a good idea to ensure you have proper drainage early on. Each site is different, and you will want drainage that can cope with the demands of your site. The fall of the arena will significantly help with draining water off your equestrian surface. Details such as the soil, top-layers, sub-layer, and your base materials will all influence how well your arena will drain away water. The addition of a roof cover will greatly improve the long-term lifespan of your arena; however, you still need to consider how you manage the run-ff from the roof. Some solutions include water storage tanks for covered arenas or directing the water safely to natural drainage systems. If you are building your arena on a slope, you will want to drain your arena down the hill, rather than to cut further into the slope. Make sure that any edging or walkways don't interfere with the drainage of the arena.You will need to consider where all that water will go once it is clear of the area. By installing a properly designed drainage system, you will help increase the longevity of your riding ring. A reliable drainage system, with proper cover, will ensure a dry ring for use all year round. Your arena base will be made up of a number of different of layers. For example, the construction of a simple ring base will start off by excavating to a good clay base or compacted soil. Many people then include at least a 100mm layer of gravel and sand that is then compacted. On top of this can be included a layer of lime and compact it. Many people will then include another layer of crusher dust before adding the final surface layer (more on that below). Keep in mind that, this advise is general and it might not work for you. Many different regions have different materials available. Some areas might have an abundance of gravel, whereas other area won't, which means it will need to be imported in, adding to the overall costs. This will often impact what you will include in the layering of your ring base. It is good to research what materials are readily available in your area. Check what materials are available, and then check how much the transport costs will be to have your materials delivered. Transport can often be more expensive than the materials themselves. Often it can cost around $15-$20 a cubic meter to deliver your materials. However, if you live close to the material source, you might be able to save on transport costs by paying an hourly rate. Do your due diligence and seek out the best materials locally to reduce your transport costs. The fall is the slight sloping of your horse arena. By including a slight slope, you will ensure that water doesn't pool on the surface. If you have an arena cover, then the impact of water pooling will be significantly less; however, the fall of your arena still needs to be considered. If your arena is on the side of a hill make sure the fall is sloping away from the top of the hill. The fall should only be slight; otherwise, it will affect your riding, and if the water runs off too quickly it could erode your top surface with the heavy rain. You want the water to trickle off the surface. The riding surface is essential to get right to ensure the safety of your horse, and the longevity of your arena. The thickness of your surface layer should be somewhere between 40mm to 80mm in thickness. The thicker the surface, the softer it will be. You will need to consider whether you want a harder or softer surface. A harder surface can cause jarring injuries, and too soft can mean undue stress on your horse's tendons and leg muscles. It's about finding the right balance for your animals and the activities they will be doing in the arena. Many people will add their surface in 10mm increments till they are happy with the surface level of softness. What Material Should You Use For The Top Layer? Each have their advantages and disadvantages. This excellent resource goes into a lot of detail about each different materials and how they can be used in your arena. The most popular material among arena owners is sand. Sand will have different properties depending on the region. Not all sand is made equal. You will want to look at the sand's quality. Is it too fine? If so, it could be blown away in a windstorm. Finer sand is also slower to drain, which means it can run the risk of holding water and be unusable for days. If the sand is coarse, is it round or sharp? Round sand can move too easily under your horse's hooves, whereas sharp materials can be too abrasive on your horse's shoes. Your best bet is to have a mix of both round and edged sand of uniform size. This will ensure that the sand won't move to easily underfoot and won't damage your horse's shoes. Make sure any sand you get has had all the silt and clay cleaned from it. Silt and clay can cause dust problems and over time will cause the arena surface to compact down. Talk to you local suppliers. Many companies will have experience with horse arena surfaces and can walk you through the process. Another good tip, is to talk to other local arena owners. Go to their property and check out their top layer. See how it feels and performs. By talking to the owner, you will be able to find relevant local information about what worked and what didn't work for them. The retainer is there to stop the surface from overflowing out of the arena. Some people choose to use timber, however, be sure to pick the right one. Get a timber that white ants don't go near and horses won't want to eat. Others will choose to have a concrete or brick retainer. Make sure that you curve the top of the retainer for the safety of your horses. Many people also choose to include the retainer in the construction of their fence. The height of your arena fencing should be around 1.2 meters from the surface to the top of your fence posts. We also recommend that the fence should slope outwards slightly. this reduces the likelihood of you leg being jammed against the fence. If you include an arena cover, we recommend placing your rails on the inside of the shed posts for added safety. And lastly, don't forget a gate! Situate your gate in a location that can allow tractors and trucks to enter in the future if need be. It is an exciting time when the final details of your horse arena are complete. The cover is erected, and you have a beautiful horse arena ready to use straight away. But there are a couple of final details you need to remember. The construction of your dressage arena will often result in a lot of dusty areas and large dirt patches. You want to re-grass these areas as soon as possible. This will stop any mud washing into your new arena during a heavy rainstorm. You also want to organise the ongoing maintenance of your dressage arena. By keeping up a regular maintenance routine, you can ensure that your new horse arena will last. By following these above tips, you can ensure you get it right the first time. Get it done the first time and continuously reap the benefits. If you are interested in building your own indoor dressage arena, check out our free extended guide to building your arena. Get everything you need to build your indoor arena from the ground up. A detailed guide to help you build an arena cover from the ground up.